Transtherm Cooling Industries specialises in the design and manufacture of air blast water coolers and adiabatic coolers for remote water cooling of gas and diesel fired genset applications throughout Europe, the Middle East, the Far East and Africa. These applications include combined heat and power (CHP) systems, trigeneration projects, where the condenser water circuit of an absorption chiller also requires cooling, and standby power generation. Many Transtherm units are operating at sites such as landfill, hospitals, sewage treatment works, banks, power generation sites, retail developments, hotels, factories, marine applications, etc. The Transtherm Cooling Industries range of air blast coolers (also known in the industry as dry coolers and dump radiators) has been developed to water cool the jacket water, intercooler / aftercooler and lube oil circuits of an engine / genset. Transtherm equipment is always built to give extremely reliable and robust performance across all models and is designed for fast-track installation. Standard equipment ships in a fully operational form ensuring that no special lifting or assembly procedures are necessary, thereby reducing on-site time and cost. A flexible range of fans and cooler unit configurations is available so that projects with environmental, noise and/or space restrictions are amply catered for. Transtherm Cooling Industries offers a range of adiabatic water coolers for the condenser water circuit of absorption chillers which are used to offer chilled water on trigeneration projects. Following inspection of our adiabatic coolers, it has been confirmed by Dr Paul McDermott of the Biological Agents Unit of the HSE (Health and Safety Executive) that, due to the multiple safety features offered as standard, Transtherm’s adiabatic system is compliant with their requirements and does not need to be registered in the UK under the ‘Notification of Cooling Towers and Evaporative Condensers 1992’ act and, therefore, does not need to be registered with local authorities. As an ancillary to the line-up of water cooling products on offer, Transtherm offers matching pump sets. Pump sets are available as single sets, with a run-only pump, or dual sets with run and standby configuration. The options of a standard sealed set, sealed set with expansion vessel and an open set with a stainless-steel buffer tank are available to suit any application. Transtherm designs and manufactures a range of cooler and pump set controls to complement the array of cooling products available. Using only premium switchgear and high-specification standardised designs Transtherm considers its control panels to be the most reliable and comprehensive on the market. Due to initiatives Transtherm has offered, the interest in energy saving controls is now greater than ever. The majority of panels are supplied complete with energy saving inverter speed control. As well as reducing the CO2 footprint for our customers, these types of controls are capable of paying back the additional capital expenditure in as little as two to three months and can even pay back the entire supply cost of the cooling package in as little as two to three years. It is Transtherm’s belief that customers should receive a reliable ‘fit and forget’ solution to their cooler and pump set control needs. With this in mind, every Transtherm panel supplied is subject to rigorous factory tests and pre-commissioning procedures designed to reduce commissioning time on site. Transtherm Cooling Industries has been pioneering the development of heat exchange products, refrigerant and water cooling systems for industrial applications since 1989. The use of Transtherm’s latest, most advanced equipment selection and 2D/3D modelling software ensures that our dedicated team of engineers provides a fast response service to any customer enquiry. Transtherm’s ISO9001 quality system, together with an on-going collaboration with the Manufacturing Advisory Service, ensures rapid build times and unrivalled product quality. Transtherm’s mission to continually improve the efficiency of service and products, in-line with the latest systems and technological advancements available, is at the core of the company’s business ethos. 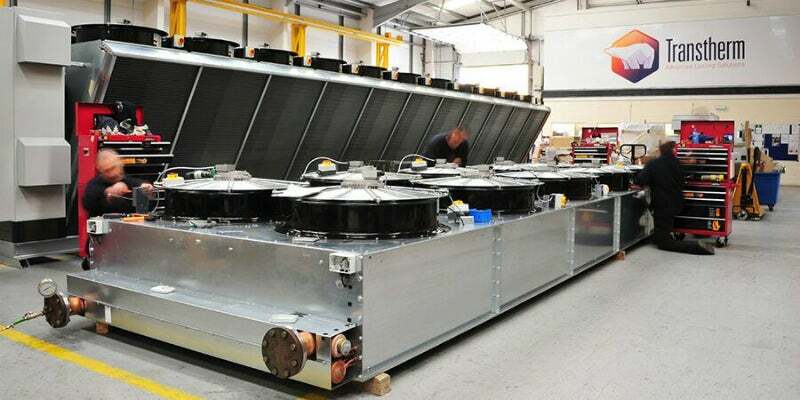 Family owned Transtherm Cooling Industries has delivered a more renewable energy power system to Birmingham Heartlands Hospital, UK, in order to help the hospice cut energy costs and become more environmentally friendly. Yes, even cooling fans need to have the odd gym workout. Adiabatic coolers are a leading water cooling solution that require less maintenance have less and lower OPEX and Legionella risk. Air blast cooling systems from Transtherm will help customers save energy. Transtherm's specialists will create customised designs to meet the the specific cooling needs of any customer. Transtherm's standalone packaged free cooling systems can improve the efficiency of chilled water systems while saving energy. Transtherm's range of complete pump sets are straightforward and cost effective, suitable for commercial and industrial use. In general, people associate cold weather with an increase in energy costs due to the heating costs, but have you ever heard about how to take advantage of the cold weather in order to reduce your energy costs instead? We're all about helping you settle on the best equipment and the best costs.